When to book- no need to book too far in advance, start looking in November. Minimum cost– assuming two adults Hostels cost approx €65 (2015), bottle of Cava €3 from CarreFour (probably more in local shops if you don’t have a car), fast food dinner €15, evening entertainment free, breakfast €10. total approx €95 plus travel for one night. Recommended place- Portus Ghanda for big crowds and fireworks (see directions in main article as well as where to stand). Key info- restaurants need to be booked in advance- no street food. Very busy. Recommended for partygoers. Ghent is a lovely small city which, although not as busy or touristy as the more frequented Beglian cities such as Bruges or Brussels, still has a lot going on around Christmas and New Year and should by no means be seen as a write off! 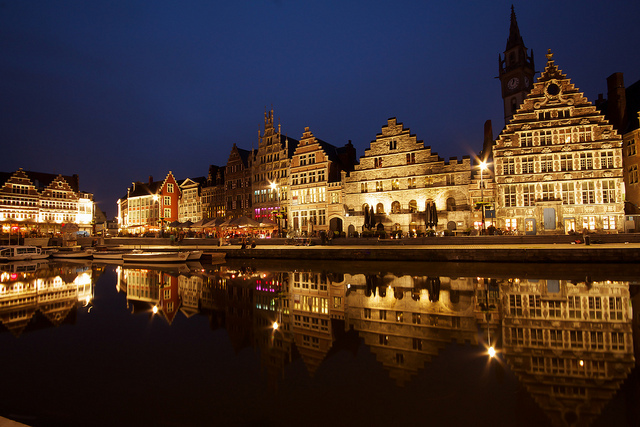 Often said to have a good nightlife, I’d recommend New Year in Ghent for travellers who want to mix with the locals somewhere where everyone wants to party! Ghent is overlooked by a lot of travellers around Christmas and New Year, probably distracted by the promises of magical markets and karaoke from Bruges. Therefore the urgency of getting booked in somewhere isn’t so prevalent when planning a trip to Ghent for the same time. Start looking in November or even early December, unless you have a very specific budget or place you want to go. Travel probably needs to be booked sooner, maybe look around October or November. The Eurotunnel can be booked up to 9 months in advance. Restaurants and bars are open as usual in between Christmas and New Year, but are often very busy. Most bars and restaurants close completely on New Year’s Eve. Those restaurants that do open will offer a set menu, for which you should expect to pay a lot more than on any other night. Most do need booking in advance and street food outlets such as the chip huts shut down completely, so make sure you book up unless you want to end up in Pizza Hut! Ghent is taken over by a typical Belgian Christmas market throughout December into the first few days of January. Although much smaller than the market you’ll find in Bruges, it fills the city centre quite nicely. This includes an ice bar and ice skating- a nice idea but extortionate prices and usually packed of tourists. I’d recommend drinking in a bar in one of the surrounding streets. There are also street food stands, a large outdoor bar serving all sorts of drinks from Belgian beers in the right glasses (for a deposit), Gluhwein (mulled wine) and hot chocolate. By the cathedral is a huge Big Wheel which costs around €5 per person (2014 prices). Museums and other attractions are also generally open usual times between Christmas and New Year, and many seem to have some sort of Christmassy event going on. Most will close from 31st December until 2nd January, or even until the first Monday of the New Year so make sure you check before making an itinerary. The same goes for some bars, cafes and restaurants. As I said previously, a lot of bars and restaurants close completely for New Year’s Eve. Those that are open will advertise their menu on the evenings before so make sure you find somewhere that takes your fancy and book up. You won’t bump into any locals at all in the evening- they’ll all be at their own private parties right up until 11.30/11.45pm. The main celebration takes place at Portus Ganda, a harbour a short walk from the city centre. We were worried about being able to find it when we visited one New Year, but there’s really no need- you just go outside and follow the crowds. If you’re not booked in anywhere, Ghent is lovely to just wander during winter evenings. We hadn’t booked (having planned to eat from a Chip Hut but then finding them all closed) so ended up at Pizza Hut, then just took a slow meandering wander to Portus Ganda. We probably arrived around 11pm, at which time it was pretty quiet. There were a few people standing by the railings who wanted a front row view, that was it. We found a high wall to sit on a distance back from the water by some blocks of flats on Veermanplein. The view was alright but as midnight drew closer large groups of teenagers with lots of booze and fireworks turned up on the car park behind us- they were just having fun and pretty friendly and harmless but I did feel on edge knowing there were drunk kids with fireworks behind us. I wouldn’t recommend sitting up there again. We were completely clueless about the arrangements for the celebration at Portus Gandus, and there seemed to be little information on the internet. There was some music playing from somewhere but no obvious key focal point and we really didn’t know where we were supposed to be looking. We’d brought a bottle of bubbly from the supermarket- there are no laws against drinking in public places- and most people seemed to have something to drink with them. Whereas in Bruges there is entertainment leading up to midnight and beyond, this is not the case in Ghent. From 11.45pm you could see private fireworks displays going off in the distance, then at 11.59 all of a sudden a countdown starts and the crowd suddenly wakes up. Everyone is counting down in different languages and you suddenly feel like part of something special. At midnight the main fireworks start- across the other side of the harbour- you really can’t miss them no matter where you’re standing. We were looking right from our spot on Veermanplein. I think the fireworks are probably set off from Coyendanspark, so for the best view you’d want to be at the railings on the further side of Veerkaai, away from the city centre and closer to Julius de Vigneplein. They go on for about 10 minutes and then that’s it- everyone leaves. Most people are cheerful and friendly- strangers coming up to wish you a happy new year, even hugging and kissing you as if you’ve known each other for years, something us Brits are not used to haha! Then everyone heads back home to their own private parties or on to the few open nightclubs which open at 11pm but don’t fill up until after the fireworks. If clubbing is your scene then you have a few choices but need to plan where you’re going in advance and possibly book tickets. Culture Club is usually open for New Year and plays house and urban music – tickets need to be pre-booked at €22 (2013 price), Decadanceopens and you don’t seem to need to book. Both are a good half hour walk from Portus Ganda. Think you’ll get a taxi? You might be lucky and get one, but it’ll be expensive- and chances are your taxi driver from the night before will be partying with you in Portus Ganda and be looking for someone else to drive him somewhere too. Club 69 is much closer but has limited capacity so probably best to get there early. Hot Club de Gand is more central and often hosts some sort of party which is free and opens from 12.30am until breakfast time, but will no doubt get packed out. Not really being clubbers, the best we could find for a New Years drink was our hotel bar, which stayed open past 1am and became quite lively once everyone had returned from the fireworks- I guess most people had the same idea as us. EVERYWHERE is closed in Ghent on New Year’s Day- even most restaurants are closed. Some might do a set lunch menu, so you need to plan what you’re going to eat and where in advance if you’re hanging around. We found one small cafe open right next to our hotel and decided seeing as that had been so easy to find then others must be open. We walked all around Ghent about 3 times and ended up going back to the first place very hungry. NO WHERE was open- bars, shops, cafes or restaurants. We’d booked a restaurant for the evening but I think we were very lucky there. Museums and other attractions are also closed, although the Christmas market does open. A lot of places stay closed through the 2nd January or even until the next Monday, so plan ahead. Complete Belgium is written by Helen and Carl - a husband and wife based in the UK. The site is recently soft-launched and very much a work in progress at this stage! We publish articles all about Belgium. If you want to stay updated please sign up to our newsletter - we will send you an email no more than twice per month detailing our recently published articles. If you've found this article interesting or useful please share with others and like us on facebook. All content copyright © 2015-2017 Complete Belgium.